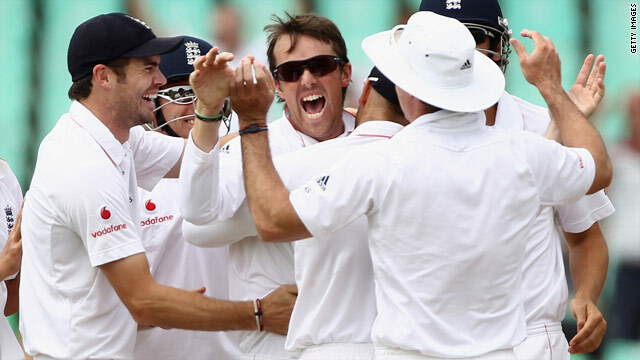 Graeme Swann (sunglasses) is congratulated by his team-mates after helping England to an innings victory over South Africa. (CNN) -- England spin bowler Graeme Swann took his fourth career five-wicket haul to help his side beat hosts South Africa by an innings and 98 runs on the fifth day of the second Test in Durban. Swann's capture of Dale Steyn's wicket -- which came shortly after an hour's play -- sealed England's first innings victory over the Proteas for 45 years, with South Africa's combined score from two innings of 343 and 133 failing to match the 574-9 declared, set by Andrew Strauss's men. The win at the Kingsmead ground also gave the tourists a 1-0 lead in the four-match series, with two Tests left to play -- the next clash between the two sides will be in Cape Town which starts on Sunday. "It's not far off the best performance I've seen from an England side," captain Strauss told reporters after the game. "I'm delighted we've stuck to our plans - we've had some outstanding performances that have laid the basis for the win. "Our seamers did a really good job in their first innings. We're going to have to keep our feet on the ground for Cape Town, but 1-0 up in the series with two matches to go is a good place to be." Swann, who was awarded the man-of-the-match for taking nine wickets for 164 and making 22 runs, was also pleased with his performance: "I'm not complaining [as] I didn't expect to do as much bowling as I have in South Africa," he said. England and Wales Cricket Board Ltd.
South Africa started the day on 76-6 and 155 runs behind the total set by England in their first innings, but were soon in trouble as Stuart Broad and Swann spearheaded the attack. Morne Morkel was trapped leg before wicket in the second over as off-spinner Swann set the tone. Mark Boucher made 29 before he was caught by wicketkeeper Matt Prior off the bowling of Broad following a review. Paul Harris added 36 runs to the ailing South African total before his mishit shot was caught by James Anderson from Broad, leaving Swann to seal the win by bowling Steyn for three runs. South Africa captain Graeme Smith told reporters that his side had deserved to lose: "England out-played us in the middle section of the match. We didn't create enough pressure and allowed them to get ahead in the game. "We were off the boil here, and that's not good enough. England were far more precise in executing their plans. We've got to bounce back in Cape Town," he said.